Heroic Fantasy Writers: Words with Tony Van Sant, author of "The Orb of Azcera"
Words with Tony Van Sant, author of "The Orb of Azcera"
Can you tell us a little bit about "The Orb of Azcera?" 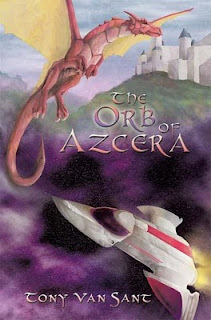 The Orb of Azcera combines the worlds of Medieval Fantasy and Futuristic Science Fiction in one epic adventure. When Agostine Brynn, a knight of King Gamaeon’s army, embarks on a quest to kill the dragon that has been terrorizing his Kingdom, he unknowingly alters the fate of a galaxy he has no idea even exists. From the dragon’s remains, the King’s sorcerers construct a magic weapon – an orb – that will serve to protect Agostine’s homeland from harm. When the orb’s power proves too much for King Gamaeon to handle however, it is up to Agostine to set things right. In the conflict that follows, the orb mysteriously vanishes from all known existence, not to resurface again until generations later. Past and present collide when the mystic orb is finally unearthed after thousands of years in hiding. Lieutenant Cale Tanner and his Special Ops team quickly discover the all-powerful nature of the mysterious orb after failing in their attempt to arrest its bearer, the renegade General Thadeon Marloc. In order to restore hope for themselves and their people, Cale and his Operatives must unlock the secrets of a world long since forgotten. What they discover defies all practical logic, and soon the lines between history and legend, between facts and myth, are quickly blurred. The Orb of Azcera follows an ensemble cast of heroes and villains from two seemingly separate time periods as they are suddenly and violently thrust together in a battle for ultimate supremacy. Since I was a young boy, I’ve always had an overactive imagination. Writing is something that has only come to pass recently for me, but imagining is something I have been mastering my entire life. For me, writing is just the vessel for sharing what’s inside my head. I am someone who absolutely loves a great story that really pulls you in and keeps you coming back for more. I knew in order to create that, I had to get really good at transferring my thoughts onto paper, so for years I worked on mastering my craft as an author. It’s not about the writing for me though; it’s always about the story. A great story can free you from the confines of your otherwise restrictive existence and take you anywhere you want to go. I love ensembles when done right. Some of the written works I have truly enjoyed have been Tolkien’s “The Lord of the Rings” and the “Left Behind” series by Tim LaHaye and Jerry B. Jenkins. Both did a great job of giving you a multitude of different characters to invest yourself in. I wanted to create a cast of characters where there was truly someone for everyone. As an avid movie buff, I also wanted to bring some old-school George Lucas style fun into the mix, but for a more adult audience. As an upstart, self-published author, Author House has been a great resource for me to get my project started. They have opened doors for me that I would not have been able to open for myself otherwise. The team at Author House has been very responsive to anything I’ve needed, and I would recommend them to anyone interested in self-publishing their work. While I would certainly love to sign-on with a major publishing house in the future, I am happy that I chose Author House as my initial publisher. I have the art department at Author House to thank for the cover design. It is just one more reason why I am very happy with them. I was extremely pleased after completing my first book signing at Borders. The location manager told me it was the most successful book signing they had ever held, which naturally left me feeling pretty excited. My greatest joy so far however came after receiving my first book review. Here is an excerpt of what Chelsea Perry of Apex Reviews had to say after reading my work. I have to admit I got a little choked up after reading it. The full review is posted on my website. What can readers expect to find on your blog? As previously mentioned, my website is www.orbofazcera.com. Visitors can find a synopsis of my book, artwork and character bios, reviews and interviews, and links to my blog and Facebook page. There is also a wide list of sites where my book can be purchased. Definitely a sequel. The Orb of Azcera is only the beginning of the series. One of the things that I loved most about writing this book is that I got to be in the driver’s seat for the first time in my Sci-Fi & Fantasy obsessed existence. I always envisioned a story where the world of Medieval Fantasy was brought forward in time into a Futuristic Sci-Fi era - kind of a “Lord of the Rings” meets “Star Wars” setting. Beyond the setting however, the true joy of this book for me was writing the characters. I absolutely love the various personalities found in this book and truly believe that readers will love them as well. It was incredibly important to me to have compelling and endearing characters that would keep readers wanting to come back for more. Whether it’s the brash yet lovable Sergeant Loxzana Terrey, the virtuous knight Agostine Brynn, or the insidious assassin Kaenac, there is someone for everyone to love (or love to hate) in this story. In writing this book, it was my objective to combine a fascinating environment with great characters and to ultimately tell a truly spell-binding story. While I’ll let you, the reader, judge for yourself how I did, I personally couldn’t be happier with the way this book turned out.